If you’ve been tolerating a broken or damaged tooth, it’s time to consider a porcelain crown. Damaged teeth can make your smile look bad and make it difficult to chew your food. In just two visits to Dr. Chi Fu at Chester Hill Dentistry, you can have a revitalized smile and a fully functional set of teeth. Crowns are often used to replace old dental work. If an amalgam filling has caused a tooth to crack, or an old restorative dentistry solution needs a replacement after years of use, porcelain crowns can get the job done. 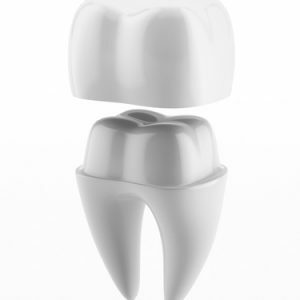 A tooth that has a very large cavity can often be repaired with a crown instead of a filling. Crowns are also used in conjunction with other tooth therapies or restorations, most notably root canals and dental bridges. After root canal therapy is completed, the tooth that was treated must be covered properly to seal the remaining tooth and its now-absent root. A porcelain crown is typically used in this situation. Dental bridges are fixed in place with crowns serving as anchors on either side of the bridge. Damaged or unsightly teeth can make you self-conscious in every situation, whether you’re at work, out with friends, or at your child’s school. The last thing you want is to feel like you must hide your teeth or limit the size of your smile because of the condition of your teeth. It is possible to restore or cover problem teeth with porcelain crowns so your smile can be complete. What Is the Porcelain Crown Procedure Like? Plenty of patients have anxiety about visiting the dentist, even when they know that a procedure or treatment is non-invasive. Porcelain crowns fall somewhere in the middle of non-invasive and mildly invasive. To prepare for a porcelain crown, the problem tooth must be shaped for the crown to be fit properly. An impression is taken of the tooth in question so that the dental lab can produce a custom-made restoration. The crown will be designed to mimic the shape, shade, and size of your natural teeth so that the repair blends with the rest of your smile. While you are waiting for the crown to be created, your Chester Hill dentist will fit you with a temporary crown so you don’t have to continue to worry about how your teeth look. Once your custom-made crown is ready, it will be positioned snugly against your old tooth and bonded in place, covering the unsightly damage and making your smile fully functional. The all-porcelain tooth crowns are one of the most common tooth crown repairs. These restorations are kind to all patients, even those with metal allergies. A porcelain crown is durable and strong, plus it looks completely natural so no one ever needs to know that you have a cap. There are three other types of tooth crowns, though they tend to be less popular with Chester Hill patients. Porcelain-fused-to-metal crowns (PFM) are incredibly tough and last a long time, but they can be problematic for patients who have sensitivity to metal. Likewise for metal crowns. There is also an aesthetic issue with metal crowns as they are made of just one material, such as silver or gold, making them quite noticeable. Finally, there are ceramic zirconia crowns, a metal-free crown option that is strong, fracture-resistant, and designed to match your natural tooth color. If you are suffering with a damaged tooth, contact our Chester Hill Dentistry office and make an appointment with Dr. Fu to find out whether you are a candidate for a porcelain crown. We serve the residents of Rye, Westchester, Rye Brook, Port Chester, and surrounding areas, including Greenwich, CT.